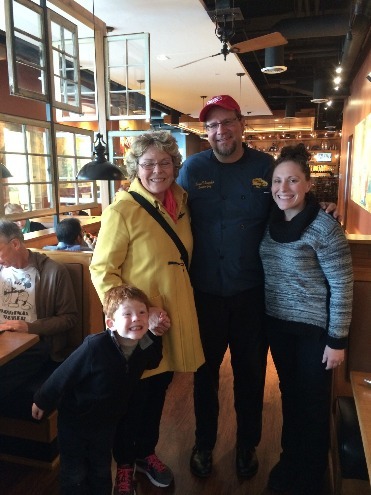 ​Tucker, my mom, Executive Chef Brian Sonoskus and I at Tupelo Honey. 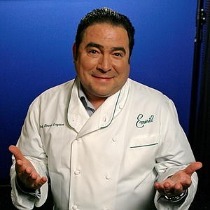 Chef Emeril Lagasse received his first culinary experience from his mother, Hilda, when he was a boy growing up in the small town of Fall River, Mass. 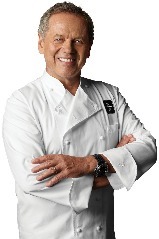 Wolfgang Puck began cooking at his mother's side as a child. She was a chef in the Austrian town where he was born, and with her encouragement, Wolfgang began his formal training at fourteen years of age. 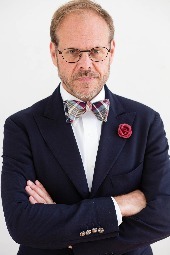 ​Alton Brown’s flair in the kitchen developed early with guidance from his mother and grandmother, a budding culinary talent he skillfully used later “as a way to get dates” in college. So often, parents "dumb" down food for their kids. They think that all they can eat is chicken fingers, mac and cheese and other "simple" dishes. 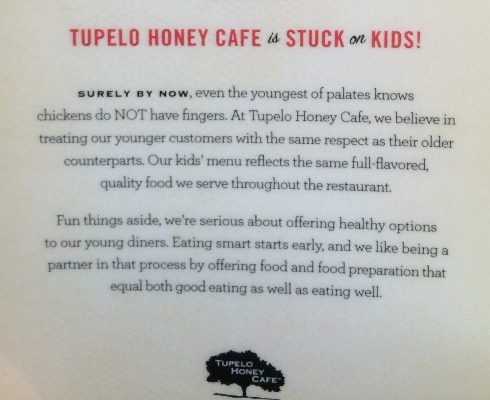 Last week, my mom, Tucker and I had the opportunity to eat at Tupelo Honey in Raleigh. While we were there, we were fortunate enough to meet Executive Chef, ​Brian Sonoskus and I had to tell him how impressed I was with the kids menu that they offered (pictured below). Come to find out, he was from New Jersey and my mother asked how a Jersey-Boy learn to cook southern recipes. He grew up cooking with his "Babushka" and in her kitchen, they used farm fresh ingredients, which shaped his drive to "always do right by local products". No matter what kind of cuisine you do, that should be the goal. This got me thinking about my own child and affirmed my decisions to make him have choices, but also be highly involved in the food he eats. I strive not to "dumb" down his food. If anything, I "dumb" down the food I eat, and he eats more sophisticated than I do. (But I am catching up!) This is something I have done with Tucker since birth, but it's never too late to start this. If you have a picky eater child, check out the blog I did for Moms Meet, where I give some of the picky eating tips that I have learned personally from a lifetime of picky eating. These tips have worked to help me to eat my vegetables and are sure to work on any other picky eaters out there. Even for the littlest of palates, where there's a meal, there's a way!